The Rare Earths Facility (REF) was a production plant in West Chicago, IL, that once produced non-radioactive elements known as rare earths and radioactive elements such as thorium, radium, and uranium. The plant was operated for 42 years, opening its doors in 1931 and finally shutting down in 1973 (U.S. Environmental Protection Agency , 2009). Electrical fixtures and gas lantern mantles were also produced at the site. Some of the elements produced at this facility were used during World War II for atomic energy programs. During the facility’s operating days, a production technique known as ore milling was used to extract elements from rare earth and other ores. As a result of this process, large quantities of a sand-like material known as mill tailings were collected at the site, and these tailings contained radioactive thorium (U.S. Environmental Protection Agency , 2009). Thorium is a radioactive metal that can be found in essentially all minerals and water. However, it can have devastating effects on human health at high levels of exposure. The mill tailings stored at the site were offered to the public from the 1930s through the 1950s. This material was “used throughout the West Chicago area for landscaping projects and to fill low-lying areas, including the Kerr-McGee sewage treatment plant, Reed-Keppler Park, and numerous residential industrial properties”. The contaminated dust from the waste piles at the site were naturally blown by the wind into the surrounding neighborhood. The dust also entered Kress Creek, a tributary of the DuPage River, through a storm sewer. As a result, the mud in the creek became contaminated along with a portion of the DuPage River (Wall Street Journal , 2013). 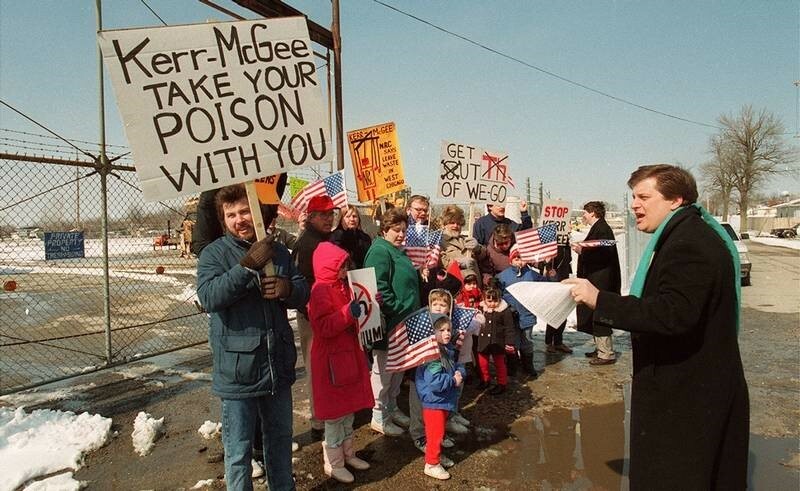 Although the EPA issued an administrative order for the cleanup at the site in 1994, there is still a lot of work that needs to be done to clean up the huge mess left after the REF closed its doors. Read the entire text of Robert Green’s article, “The Aftermath of Rare Earth: A West Chicago Nightmare,” here in pdf or Word format.